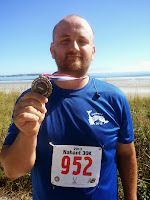 I'm still awed by my performance that the 30K run I did on Sunday, September 29, 2013. Maybe that sounds a bit conceited. I don't mean it to be. My mind is still reeling from the accomplishment. That I could do a 30K still shocks me even though I did it last year. But that I did the run today in a personal record time that I didn't think I could do, just leaves me awestruck. I should mention that I cried twice during this run. I couldn't help it and truth be told, I didn't want to stop it. I've talked about crying while running before. It's just something I do. Somewhere between the physical exhaustion and the mental realization that I am doing something that for much of my life I thought was not only crazy to do but beyond my ability, I'm overwhelmed with the fact that I am not only doing it, but actually enjoying it. And so the tears of joys and the heavy sobs are signs of pride. Horror Part IHorror Part IIScience fiction Part I Just a note about the links and categories. Not all links will open up a new tab. If you want to open a new table with a link, either press the "Control" button when clicking or right click and select the "Open in New Tab" option. As for categories, I've tried best to put authors on the pages that I think they fit with regard to genre but many of these authors cross the genres of horror, science fiction, and fantasy (sometimes within the same story), so they are not as clear. So your favorite horror author might end up in fantasy, but they should be found throughout.